A multinational week of action by the ITF and maritime unions in ports around the Black Sea has brought results and challenged conditions for seafarers working on what the ITF has called the ‘sea of shame’. The action by inspectors and union members in Bulgaria, Georgia, Romania, Russia, Turkey and Ukraine came as the ITF published an updated version of its 2012 report, Black Sea of Shame. The new report found continuing poor standards of living and working conditions, low wages and unseaworthy vessels still operating in the area two years after the ITF launched an intensive campaign to expose the shameful conditions for seafarers working in the region. The Black Sea remains one of the most dangerous places on earth to be a seafarer. As well as challenging these poor conditions, the week of action – which took place despite the current political difficulties in the region – took the opportunity to inform seafarers of their rights, particularly under the Maritime Labour Convention 2006 (MLC) (the ‘seafarers’ bill of rights’), which started to come into force last August. The report says that the MLC has yet to make a serious impact in the region, which is ‘still a haven for older vessels with inadequate insurance, operated by owners with scant regard for obligations to their crew’. However during the week Bulgarian port state control detained a vessel for unpaid wages following an inspection by the campaign team from the Bulgarian Seafarers’ Trade Union. 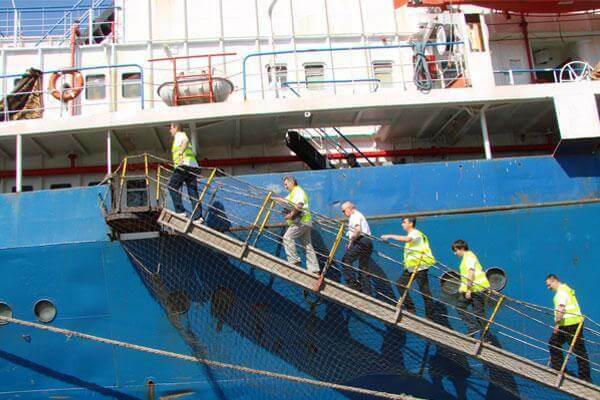 During the week, teams of inspectors and union activists carried out over 100 inspections in 17 ports. The solidarity action even included activity in Ukraine, in spite of the current political situation, involving trade unionists in Theodosia in Crimea as well as other Black Sea ports. The inspections uncovered many examples of very low wages – as well as poor living and working conditions – on vessels without collective bargaining agreements (CBAs). As well as providing vital information to seafarers about their rights under the MLC, and the work of trade unions in protecting seafarers, the campaign week received extensive media and online coverage, especially in Romania and Ukraine. In Constanta, Romania, ITF inspector Adrian Mihalcioiu initiated legal action in the case of the Belize-flagged Nikolay Meshkov, abandoned with 12 Ukrainian and two Russian crew members on board. ITF inspectors issued many warning notices to vessels without a CBA (collective bargaining agreement) and where wages were too low – most of these were registered as flags of convenience. As well as giving support to individual seafarers and improving conditions for crews by negotiating for CBAs, the action week stressed the need for the governments of the Black Sea states to take drastic action to prevent it continuing to be a ‘sea of shame’.